Urban Reality | Charrette of simple, doable urban improvement observations and ideas. Charrette of simple, doable urban improvement observations and ideas. I recently had the honour of visiting Amsterdam. Amsterdam is a city where 48% of all trips made in the city centre are made by bicycle. A total of 78% of trips in the region are made by walking, cycling and transit. Only 22% of trips are made by cars. This is most impressive when you notice who is cycling, as you will see people of all ages, and significantly more women cycling. People are dressed in everyday clothes and carry out typical everyday tasks. 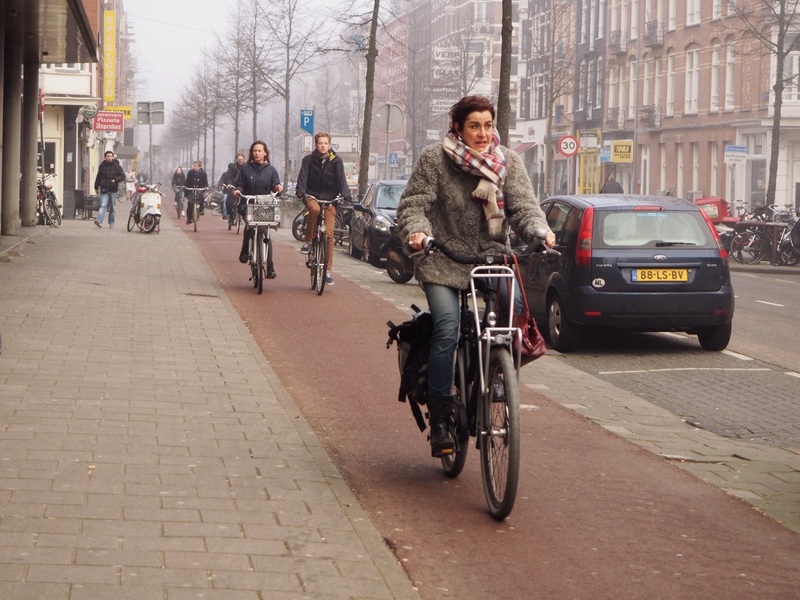 With the resurgence of cycling around the world, Amsterdam in often the subject of case studies. People often assume that the Dutch culture operate in a elevated understanding of all things cycling. However there have been very surprising discoveries while exploring this city. 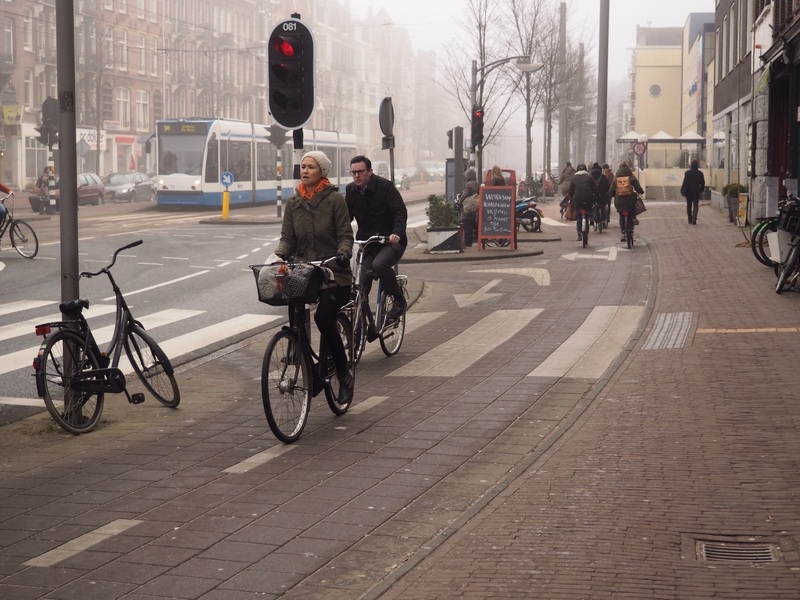 Many of these observations reveal that the Dutch are not a divine cycling culture, and pleasantly highlight that there are basic steps other cities can take to move towards a safer and inviting cycling and walking environment. 1. There is still a place for cars. Despite the high rate of people cycling, cars were still seen parked in every nook and cranny of the city. Supporting cycling does not mean that you banish the vehicle outright, you permit access for cars but tolerate them at slower speeds. This demonstrates other cities can achieve a high cycling rates while still accommodating the automobile. 2. When you don’t want cars, use barriers to keep them out. The Dutch do not operate from an elevated state of mind. When the Dutch want to keep traffic out, they put up barriers. When they want traffic to slow down, they build the road to feel unsafe at unsafe speeds. The Dutch do not plan on good faith from people driving and anticipate that vehicles will take advantage of a situation. Consequently the Dutch physically build the roadway to get the result they want, which is to slow down traffic to protect people walking, cycling and using transit and create a pleasant place to live, work and play. When you narrow the street, use chicanes to make travelling in a straight line impossible, and make streets incredibly pleasant places to walk, bike and stay, these all make people driving think twice about their speed. 3. Not all cycling routes are separated from vehicle traffic. In North America there is currently a fixation on adding separated cycling lanes in every city. While it is great to finally see movement to provide safe, convenient access for cycling. However we must not assume a one size solution fits all, that is what got us where we are in the first place with an auto-oriented priority. We must not lose sight that there are other tools to achieve the same results. Only 50% of the cycling routes in the Netherlands are separated from vehicular traffic. According to the C.R.O.W. Manual the Dutch only use separated or protected cycling lanes when the traffic volumes and speeds are sufficient high enough to pose a threat to lives of people cycling. Alternatively the Dutch use painted bike lanes, shared streets and woonerfs (a residential version of the shared street. In all cases the Dutch ensure that the physical design of the street only tolerates a safe vehicle speed, they do not rely on suggestive tools such as posted speed limits. 4. Retail streets still survive and in fact thrive. Most businesses in North America oppose adding bike lanes in front of their businesses for the fear of losing driving customers and running out of business. Businesses often over estimate how many of their customers drive. The businesses in Amsterdam not only survive with a bike lane in front of their business, but they thrive as inviting, interesting places to shop, live and play. It is important to point out that one concern of businesses may have some teeth to it, parking must be maintained as explained by the next point. 5. Parking and vehicular access is provided on almost all retail streets. 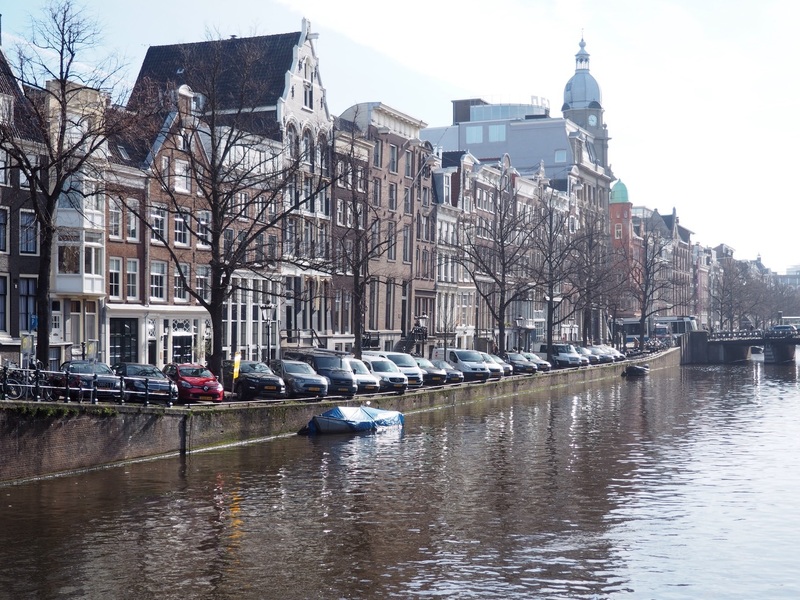 With the provision of on-street parking on almost all retail streets in Amsterdam, it is clear that providing access for vehicles is still important. Parking is also critical for providing access for deliveries of supplies. This way all modes of transportation can access the businesses safely and comfortably, maximizing the potential patrons for businesses. 6. Bike lanes do not prevent crucial business deliveries. As mentioned above, by maintaining on-street parking on retail streets, access for loading and unloading is still provided for delivery trucks without having them block traffic by double parking in the travel lane. In addition to this large vehicles can be found in most places in Amsterdam. 7. 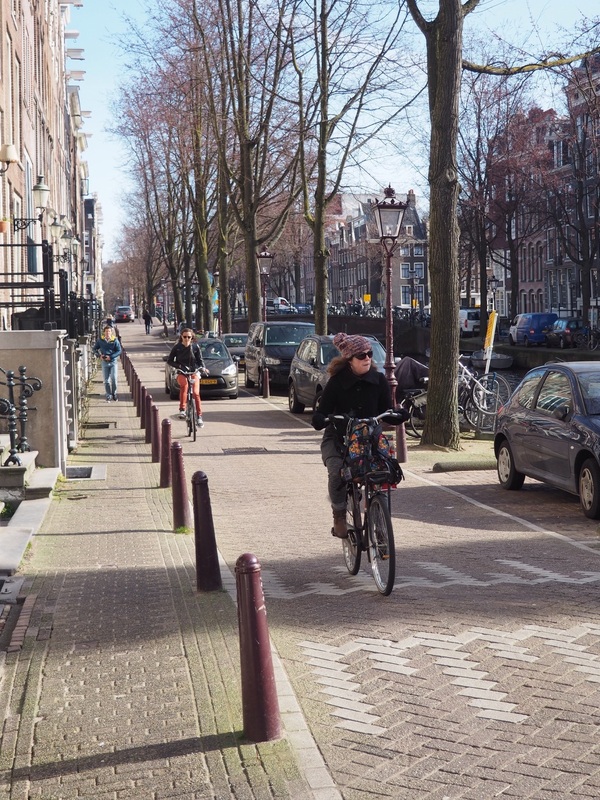 Street widths in Amsterdam are comparable to North America. The excuse often in North America is that there is no room on the streets for bike lanes. 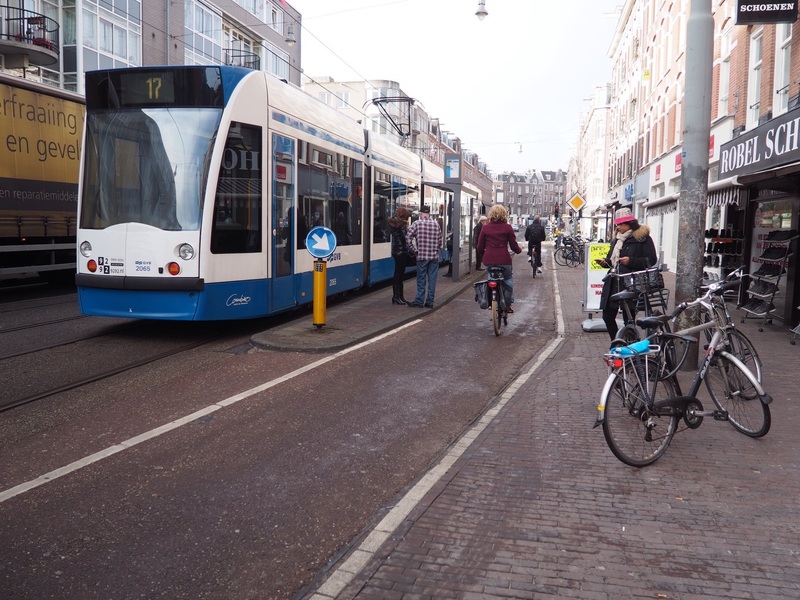 The streets in Amsterdam have comparable widths but can still accommodate a complete street including wide sidewalks, patios, two cycling lanes, two parking lanes and two lanes of traffic. 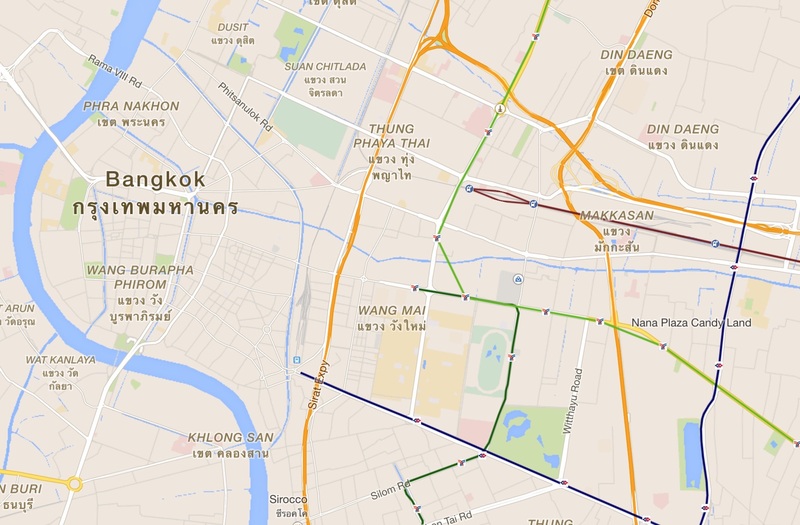 Even larger streets also accommodate at least two lanes of transit and transit stops. 8. Transit stops and bike lanes can mix. We need to stop reinventing the wheel! Often in North America bikes and buses will share a curb side lane creating a dangerous situation. People cycling are forced to overtake the bus at transit stops, which inevitably results in a bus, cycling chicken game with each constantly overtaking the other. The Dutch have already figured out how to make cycling and transit coexist, using floating transit stops and generous sidewalks it works. People cycling can go around the transit stop maintaining their dedicated right of way, while transit patrons can still board and disembark the vehicle safely and efficiently. This entry was posted in Uncategorized on March 13, 2015 by dnproulx. Travelling in South-East Asia as a visitor on foot with no formal roots, the large urban environments here can be at times unbearable if not undignified. Asia is not kind to those on foot, the sidewalk space typically reserved for those on foot like in other countries often faces stiff competition from motor vehicles looking for parking or for shortcuts around the throngs of traffic. In other times sidewalk space is often competing with the various street vendors. Add in the excessive noises, heat, and smells that you often come across, a few hours of this and a break from it all is often required. Often when you look at a map for a place to get away from it for a second, you will often find there are only one or two large public spaces very far away. You are left with two choices, either pay up to get a seat inside a restaurant or walk 30 minutes to an hour to get to a park. Neither are favourable nor fair, on the one hand the city is saying they only care about your well-being if you have money to spend. On the other hand large public spaces are not fairly located or distributed in the city, they require concerted efforts to organize and large funds to build and maintain. Large public spaces are not a symptom reserved only for South-East Asia, this is a a problem synonymous with cities across the world. While some larger parks or plazas are needed to afford the amenities that smaller spaces can’t accommodate like sports or festivals, they fail to spread the pleasures and benefits that public spaces can offer fairly. The thinking behind public spaces is often misguided, I think most mayors and city planners think that people will spend hours in a park. People may do this from time to time with an organized BBQ or picnic with friends and families. This is all fine when we have the time to spare, but what about when we are in the hustle and bustle or daily 9-5 life? All we need is a momentary respite from daily life, a few minutes to rest and recharge your energy levels while you eat your lunch. I was recently reading Jeff Speck’s Walkable City where he put it nicely that parks are boring, a few minutes are enough for most people. Jane Jacob also has a lot to say about public spaces, mainly that they should be small and surrounded by a diversity of useful daily conveniences. I am currently reading Jamie Lerner’s Urban Acupuncture where he says something along the lines that large spaces make you feel like no one owns then, whereas small spaces make you feel like only you own them. The key word is small. Similar to moveable chairs, small public spaces allow you to be in the space and make it feel exactly perfect. They do not become overwhelmed with too many people, it is easy to control the environment. Small spaces also cost very little as they can be fit in the various left over space across cities and avoids the costs of acquiring land like large parks need. Often all you need is a place that offers shade, moveable chairs and tables and a view of the public life, it is very easy and low cost. I was recently in New York City where my wife and I retreated to the Paley Park for a quick break. Paley park is the very definition of a great small space. It has moveable chairs and tables, a security guard and a refreshing waterfall at the end. Paley park offers a brief respite from Midtown New York City. My hometown Edmonton has been having the right discussion regarding urban spaces. 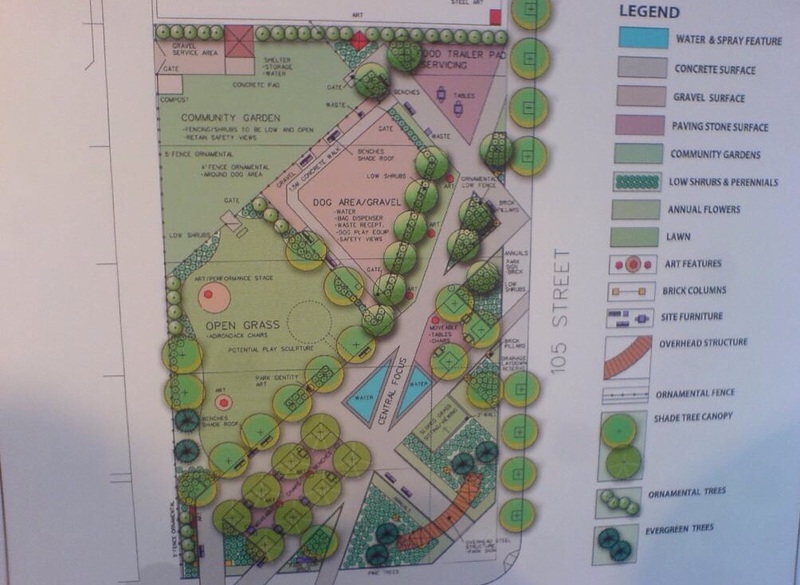 The discussion around these spaces is usually being initiated by the business improvement associations, such as the new downtown 105 St park/plaza. A survey was also circulated to revitalize another space on 124 St which used to be a former streetcar bay. In both cases the spaces are small and yet the discussion is resolving around maximizing their activities with some sort of cafe vendor anchor, public seating, urban gardening plots, dog parks and interesting environments. Of course in the process of writing this, Asia has proven me wrong. They do know how to do small spaces correctly, as shown by the Chiang Mai examples above. This space in particular reminds me of strip malls back home, what an easy solution to such an eyesore. Move the vehicular parking to the rear to maintain access for driving while creating a local community space anchored by the existing businesses. If space is in short supply, parklets are also another great way to bring small spaces to where the people are. Street parking is often provided in such abundance that removing a space or two per block won’t have any effect. For a few thousand or hundred dollars we can provide a small space of respite within minutes of walking and without the need to spend money, this is true equity. Vancouver has seen a boon in parklets in the last few years. Parklets are great because they add space right where the action is, at the often overcrowded sidewalks. If funding is limited this can still be done, the key is to think lighter, quicker, and cheaper, the New York Times Square conversion started off with Costco recliners. To ensure the success of these spaces start with a non-permanent treatment, use moveable chairs, tables, landscaping and barriers. Once it has been around for at least a year and you have an idea how people are using the space, then you can start making things permanent with higher quality materials such as concrete, water features etc. The worst thing we can do is to add in permanent changes that don’t suit the way people interpret or use the space. To start off all you really need is a few chairs and tables along with some shade, plants and paint. If the engineering codes say that these do not meet safety standards, then your city need new safety standards. 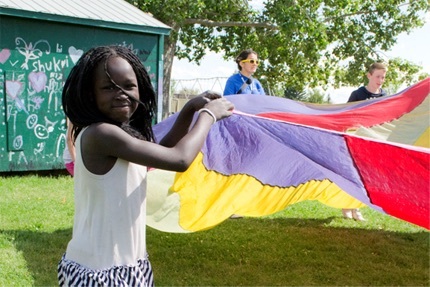 You can use “green shack” similar to those Edmonton uses for the temporary summer sports equipment for children. These shacks or sheds can be a temporary and light way to store the chairs and tables overnight to avoid theft. You can hire someone, or find someone in the community willing to volunteer their time to bring them out and put them away every day. You can start with just one day a week on the weekend, and eventually expand it into the rest of the week. Use large, heavy planters to liven up the space quickly and cheaply but attractively with greenery and shade. Like New York use strong adhesives or paint to add decorative surface detailings, and when you get the funding make these details permanent. Let’s think about achieving the results we want to have but with the lighter, quicker and cheaper mind set. Small parks are one way to do this. The results can be spectacular with increased livileness and safety since more people are staying in the public space adding eyes on the street. This is not to say that large parks are bad, when done right they can be a truly great addition to a city. For example Bryant Park, Washington Square, Madison Square park in New York City are all great examples of large urban parks. Part of the reason these are all great is because they follow the Project for Public Spaces rule of 10 activities. 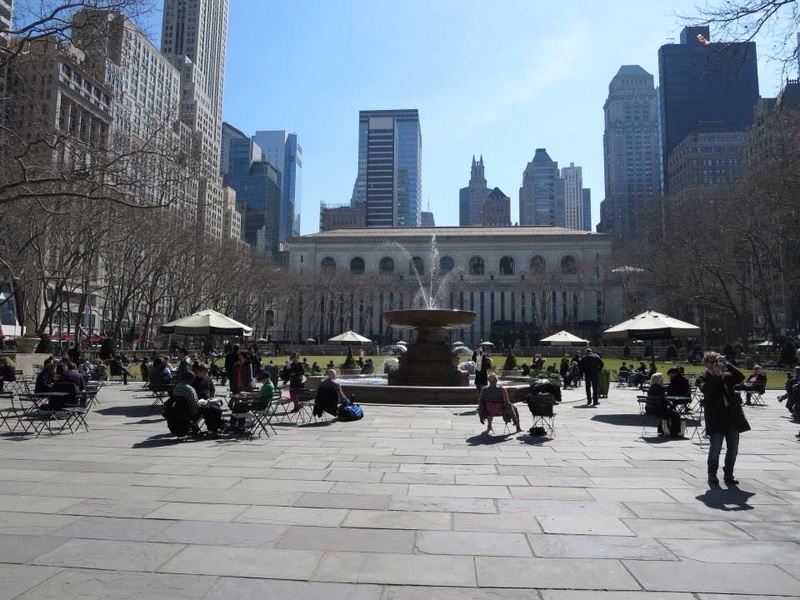 However for the case with Bryant Park it is subsidivided into different “zones”. You have a zone for games, a carousel, various cafes, mini libraries and it is flanked by the New York Public Library. Essentially Bryant Park is a large park that has been broken down into many smaller parks. However, that being said the major benefits for small spaces is their adaptability, affordability and ability to bring the small moments of respite to more people. This entry was posted in Uncategorized on February 28, 2015 by dnproulx. I am now 3 weeks into my world travelling trip. Having explored most of Vietnam and a small part of Cambodia, I am struck by the innovation that you see here. You will often find creative solutions to establish a business. Have you ever seen an entire restaurant tacked on as a motorcycle sidecar? Otherwise you will often find that a persons home is also their business, or several businesses. Many buildings will have some sort of business, be it a restaurant, bar, convenience store, renting motorcycles out front, rooms to rent out in the back, and a small room they reserve for themselves to live in. People do whatever it takes to earn that extra income necessary to get by for the next day, space is not wasted. In Vietnam, during lunch time you will often see an entire family eating lunch right in the middle of their business. The lines between home and business are blurred. This made me think of the chances of this happening back home in Canada, most of it would be next to impossible, if not illegal. If you think about the many hurdles an individual must overcome to run a successful business. Permits, licences, inspections, parking requirements, regulations, zoning…the list goes on. All of these cost money and time. Has over-regulation gutted our ability to innovate? Have we destroyed our ability to provide income earning options for the middle and low income classes? I am reminded of the recent resurgence of the food-truck scene in North America. For the most part the only “food truck” cart around were hot-dog carts. It was very surprising to learn that food-trucks were banned in many cities like Montreal. While it seems new and cool in a North American sense, travelling in the developing countries shows just how normal it is in the rest of the world. I remember the story of my friend who opened a food-truck in Edmonton. Under current laws food trucks were prohibited or difficult. The city didn’t have bylaws describing how to handle where food-trucks could park, there was no definitive way to handle an application for parking and the permitting process was long and tedious. My friend decided to go with the food-truck in the first place because it was less capital intensive, as they didn’t have the large amount of upfront capital to afford a brick and mortar restaurant. Now after several years successfully operating a food-truck, my friends have now gathered enough capital to open a brick and mortar restaurant while also maintaining the original food-truck. A food-truck gave a talented chef a foot in the door to owning his own business. While the city and numerous others have since then changed their tune and made it easier, the process took years. This sort of incrementalism is a life line for the middle and low income classes, it allows you to start off small and work your way up. It is up to the city and governments how much they want to enable innovation and income earning. For the most part most cities are disabling and overbearing. I have often been saying cities and governments need a department or committee of innovation, whose sole purpose is act as an interdepartmental, multidisciplinary team that searches for ways to achieve the same outcome but cutting the red tape. This would be a department that seeks to collaborate internally and externally to break down the barriers that get in the way of innovation and income earning. Cities are all too happy focusing on the big catches, setting policies to attract the large firms, developers and investments. This is a red herring, it is actually the sum of its parts that makes any city successful. One particular firm or building, while it may be splashy and make headlines is not as powerful the revenue generator we all think it is. This responsibility lies with the thousands of small businesses and individuals, it is time we start focusing on them. As this article points out the revenue and job creation potential of a small building in the downtown versus a large suburban Walmart is far greater when focusing on a per land unit basis. One of the most crippling obstacles standing in the way of small scale businesses and developments is the city zoning and parking bylaws. I really like this other article by the Strong Towns team, it really highlights just how much our zoning and bylaws are gutting our ability to enable the entry of low capital businesses into the market. This leads the way to our present situation in North America where only high capital developers can afford to develop anything, and high capital businesses or chains can afford to fill the spaces built. This will ultimately only result in more of the same and only a few having a say. To survive in today’s global world, with a declining middle class and incomes, we need to introduce flexibility. We need to open the doors for low capital businesses to kindle innovation, and remain competitive. We need to ease rules about where businesses can open. Form based zoning, is a great example, it is concerned more about the appearance of the building and is less concerned about the occupying business. This type of zoning leaves the building use up to the market, which will support greater mixed-use, flexibility and income earning. While many of our regulations have the right goals and intentions, the path they take to achieve the results can really be quite destructive. We can achieve the same level of health, safety and aesthetic standards with the use of more flexible regulations. As a result cities will become more vibrant and economically resilient bringing a more diverse array of amenities and services closer within walking distance of where people work, live and play. This entry was posted in Uncategorized on February 17, 2015 by dnproulx. In an earlier article, I highlighted my observations in the Hanoi Old Quarter. This area has many of the qualities of good urbanism including small scale streets/buildings, interesting details and a high density of residents, visitors and businesses. Despite these great qualities, the area is held back from being a great walkable destination due to the crowding from motorbikes, cars and vans. I drew a comparison to Bogota, proposing traffic calming to restrict vehicle access. It is best to look for local examples when discussing an initiative like this, and luckily I found some examples. The issues with the motorbikes also extended outside of Hanoi’s old quarter to the rest of urban Vietnam. Often you will find little regard for the space typically reserved for people walking else where in the world. It is particularly frustrating when you will be walking along on sidewalks and motorbikes will start crowding you on the sidewalk like the image above. Luckily people in Vietnamese have found the most effective solution that Bogota also used, put up barriers and physically prevent motorbikes from travelling through. While this is a minor inconvenience for people walking, it works. The barriers were typically used as a low cattle-gate manner around parks maintaining the tranquility. This has been proven to be highly effective in creating walking safe havens from the motorbike chaos, and should be deployed citywide as done in Bogota. The other example came from a small Vietnamese town on the eastern coast, Hoi An (not to be confused with Hanoi!) The Hoi An historic town centre was composed of human scaled buildings and narrow streets. In the evenings, the Hoi An historic centre was converted into a car free zone. The solution was quite simple but effective. They simply used the signs depicted in the photos above, declaring Hoi An as a “Walking and Cycling Town.” This removed the motorbike and vehicular traffic creating a peaceful environment to enjoy the areas shops, restaurants, heritage and famous night lanterns. All it took was a few attractive signs and guards to redirect the traffic to alternative roads. Similar to the Ciclovia which closed kilometres of roads in Bogota, this has also proven to be effective in Vietnam for calming the motorbike. These car-free zones would be effective in creating small pedestrian and cycling areas such as the Hanoi old quarter, and where necessary maintaining a few access roads for business deliveries. These can be incrementally expanded to cover more areas based on demand. This entry was posted in Uncategorized on February 16, 2015 by dnproulx. 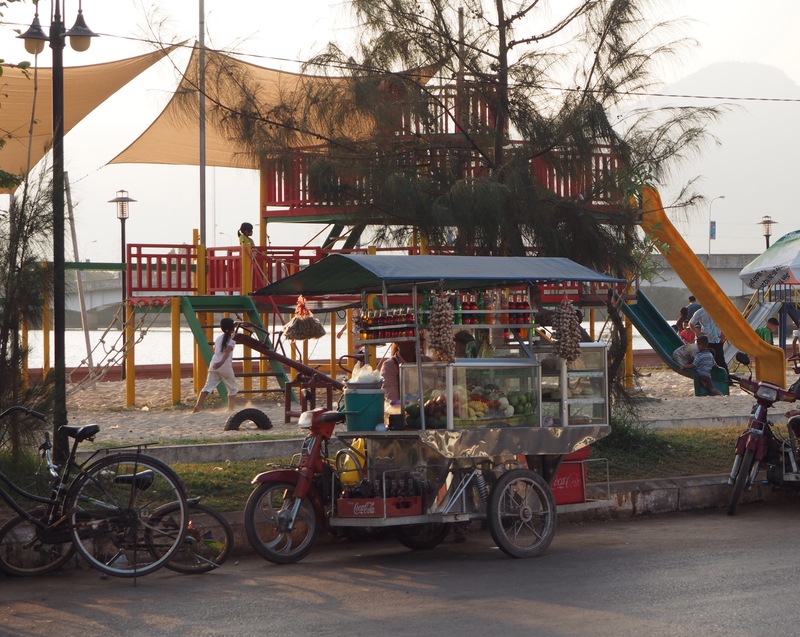 Vietnam still has a strong cycling culture, not only that but it has a strong upright cycling culture. The rate of upright cycling is often used as an indicator for whether a culture views cycling as a recreational activity or a viable transportation option. Bicycles do appear to be a life line for people in Vietnam for everyday utilitarian errands. People are dressed in everyday clothes, not Lycra, and proceed at a casual pace. For more information on upright cycling read this great article from my colleagues Chris Bruntlett and Brent Toderian. 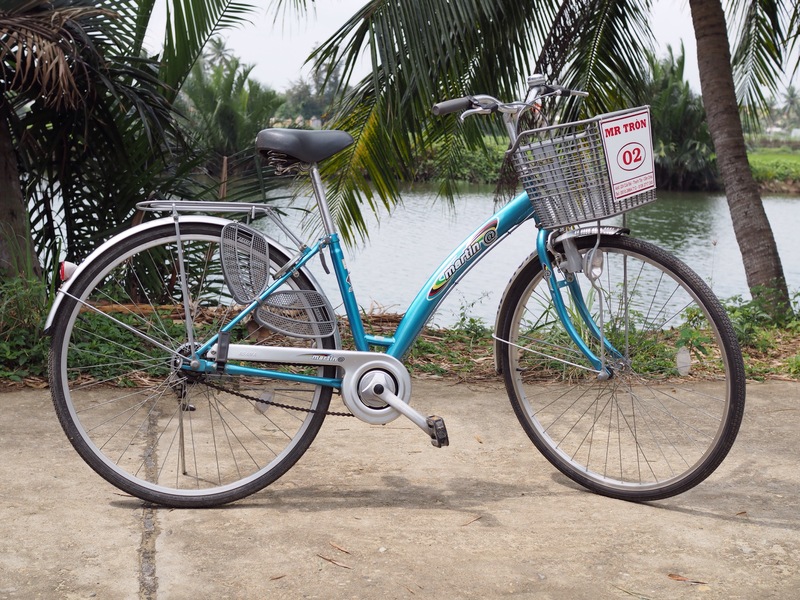 Bicycles come standard awesome in Vietnam! They have all the features that make them a sturdy, reliable, fun and useful ride. Baskets for carrying your daily goods. Full fenders (including skirt guards) for keeping you dry and clean. Self-powered Dynamo headlights for night time visibility. All of the bikes are also gender neutral with step through frames. Kickstands! Oddly it doesn’t feel overly dangerous riding in traffic in the rural areas and smaller villages with lower traffic volumes. This is not to say it is not intimidating, especially in the cities. This could partly be due to the relative slow speed of traffic due to the chaos. Most people driving on the roads are used to having to react to something out of place. People will also give you a courtesy honk letting you know they are there (which admittedly gets old, fast). 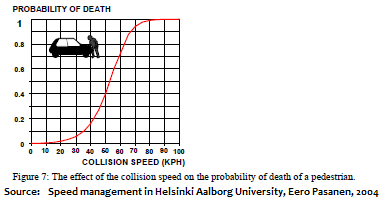 I am reminded of the numerous studies showing that cycling safety actually comes from high numbers of people cycling. While it may look like chaos, the irrationality and unpredictability of Vietnamese roads forces people to proceed more cautiously to avoid collisions. The most intimidating aspect are the cars which are often driven fast and recklessly as if entitled. The best cycling experiences are by far in the rural areas and villages. This is also seen with the higher volumes of people cycling there, especially the uniformed students. Quite often you will see many of the behaviours prominent in Dutch cycling: people doubling up, conversational cycling, large numbers of bicycles parked at schools, and people dressed their best for daily errands. Certainly a strong cycling culture deserves strong cycling infrastructure that provides a safe, comfortable and useful cycling experience. This entry was posted in Uncategorized on February 12, 2015 by dnproulx. If it seems odd that I am blogging about Hanoi, allow me to elaborate…I am currently undergoing a five month trip that includes South-East Asia, Europe and South America. From time to time I will be writing posts on my observations. The streetlife in Hanoi’s old quarter oozes from every square inch of alleys, balconies and sidewalks. People live their lives on the streets with their businesses, socializing, meals, and resting. Part of this is because it appears people have no choice, they have to be on the street in order to make a living. The street is a free asset which people can utilize to elevate their standard of living, and they do! You see all sorts of informal businesses setting up shop on its streets, many other roam the streets with shoe shining, fruits and vegetables, various foods, peach blossom branches, brooms, balloons, hoping for that serendipitous sale. In other instances people are on the streets because it is the place to be. The street is where the action is with the best food, drinks, music and people watching. 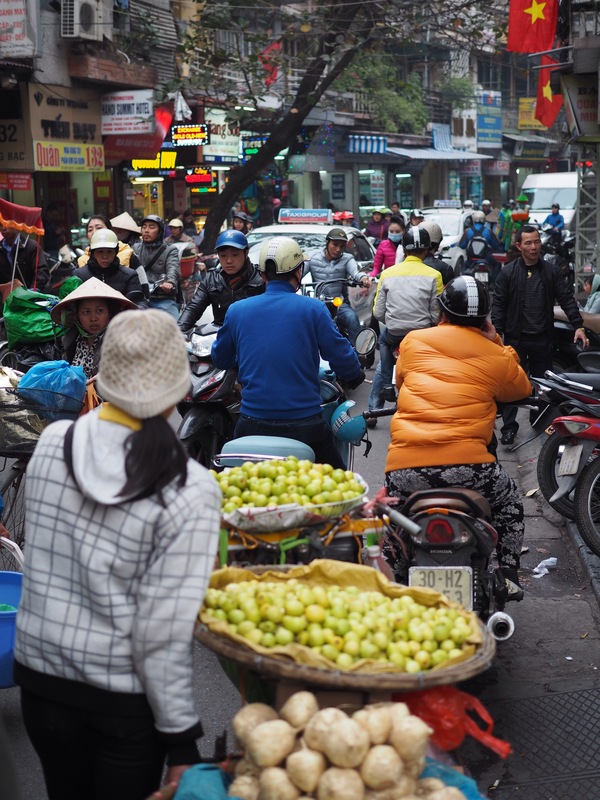 What works about the Hanoi street life and what doesn’t? The Old Quarter certainly fills many of the criteria listed by the great urban theorists such as Jan Gehl. The Old Quarter was developed incrementally and organically as seen from the spaghetti mess of streets leading in every odd direction. The Old Quarter is also human scaled. The buildings are only 3 to 5 storeys tall and the streets are only a few meters wide. The buildings have attractive architectural details. The ground level consists of commercial and retail uses with residential behind and above. What is really interesting is that the buildings are very skinny, maybe 5 meters. This is not only an efficient use of land as a smaller footprint means that people with less capital are able to purchase or lease space for their business. This also means you can also fit more businesses in the same amount of space. The high density of businesses may result in “spontaneous shopping” where people make spur of the moment purchases at your business because they were in the vicinity for other businesses. In fact there was a high level of specialization present (where a business only sells one line of product) which is only possible with a high level of foot traffic or with smaller business footprints in an area that has other businesses selling other products. If you know anything about Vietnam, it is that the Vietnamese love their motorbikes. The vehicular traffic is by far the worst part about the Old Quarter. Not only will you often have hundreds of motorbikes zipping through, but you will have North American sized vehicles, taxis and mini buses trying to bully their way through. Despite this the streets are still busting at the seams with people walking, cycling and sitting on street patios. Vietnam also still has a strong cycling culture, and it is sad to see that South-East Asia still trying to adopt auto-centric changes when the rest of the world is starting to reverse the tide. From my observations I am reminded of Penalosa the ex-mayor of Bogota, who said he couldn’t make everyone rich but he could give them dignity and happiness. I would have to differ from Penalosa on one point. Providing a safe and dignified way to walk and cycle for work and play, you give people a platform of low cost mobility to escape poverty. Using Bogota as an example, Hanoi could definitely benefit from traffic calming. Bollards should be installed on the sidewalks to keep the motorbikes off and allow free passage for pedestrians. Space should also be designated for the street businesses. The large vehicles should be banned, and access should be preserved for the motorbikes and bicycles. Traffic calming should be employed to slow down the motorbikes. With these changes you would be able to free up space for businesses and create a more comfortable experience for more visitors and patrons, while still maintaining access for slow moving motorbikes and cycling. This entry was posted in Uncategorized on February 4, 2015 by dnproulx. 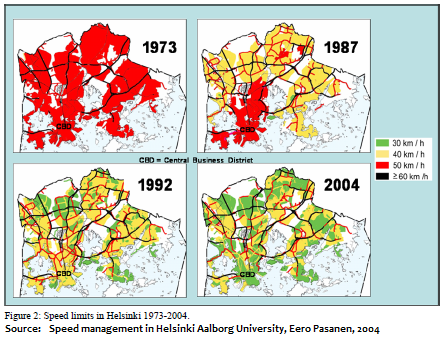 Helsinki originally reduced speed limits on their highways in 1973. In 1987 they reduced speed limits to 40 km/hr (25mph) on suburban residential streets. In 1992 they reduced the city centre to 40km/hr too. Finally in 2004 the city reduced all 50 & 40 km/hr speed limits to 40 & 30 km/hr respectively. We are well aware of the effect slowing down traffic has for the safety of people walking and cycling that are involved in collisions with vehicles. Both in 1992 and in 2004, the suggestions of speed limit reductions met hard resistance especially from the business circles. It was claimed that the reduction of speed limits would jam the whole traffic-system and ruin conditions for commercial activities in the city centre. It was also claimed that the amount of exhaust emission would increase dramatically. There was a rather embarrassing false reasoning behind these claims. Everybody knows that congestion causes slow speeds. However, this does not mean that low speed limits cause traffic jams. The capacity of a given lane depends on the time-intervals between successive vehicles. The slower the leading car drives in front of a queue, the closer follows the next car. From the point of view of capacity, it looks like the optimal speed level in urban street network is somewhere between 30 and 40 kilometers per hour (figure 5). 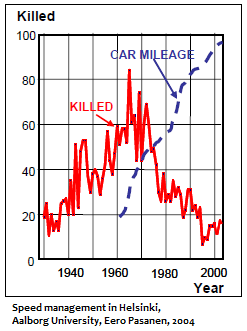 So there you have it slowing down vehicles can reduce unnecessary fatalities and move more people at the same time. For businesses that think slow speeds will be a death knell, consider that vehicles travelling slower means they are on your street longer and it is more likely they will see your business. Additionally reducing vehicular speeds also reduces the noise made by vehicles, this would also help reinforce a pleasant sidewalk shopping environment. It seems that slower speed limits are the panacea for creating livelier cities, so why are we not embracing this as much? Speed reductions from 50 to 30 kph typically reduce noise levels by 4-5 decibels,66 or more in some circumstances. This entry was posted in Uncategorized on December 3, 2014 by dnproulx. My name is Darren Proulx. I have a Bachelors of Mechanical Engineering from U of A in Edmonton and a Master of Urban Studies from SFU Vancouver. I actively explore ideas and conduct research, observations to provide evidence for improving the value we get from our streets, and cities.